Fifteen years in global history is a short period of time. At the turn of the 21st century, the global community committed itself to a far-reaching and comprehensive mission to promote human development. Few, at that time, would have anticipated the transformative effect that information and communication technologies (ICTs) would have over the next fifteen years. Moreover, few would have anticipated the tremendous challenges that the world would have in restoring the global ecological balance and in protecting the earth from destruction by humankind. Today, few will question the capacity of ICTs to serve as enablers of sustainable development that the world community has agreed to work towards by the target year 2030. However, although this capacity of ICTs as enablers has been recognized, there remains fuzziness about the linkage between ICTs and the achievement of the Sustainable Development Goals (SDGs). 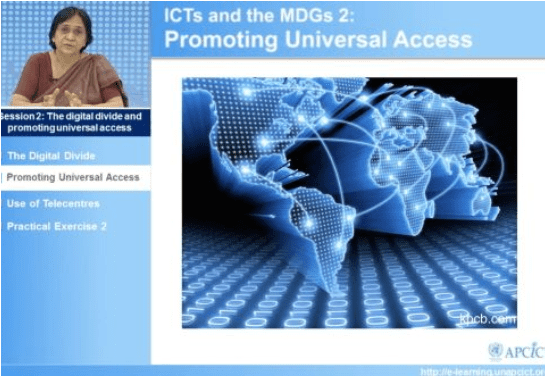 This module addresses the SDGs through the prism of ICTs. It provides an overview of the intersections between ICTs and the SDGs, drawing attention to the various dimensions and sectors in which ICTs can provide valuable support through national governments’ plans and projects. The module invites readers to explore the various dimensions of the linkage through case studies of ICT applications in key sectors of development in Asia-Pacific countries. The module also highlights key issues and decision points, from policy to implementation, in the use of ICTs to meet development needs. The aim is to foster a better understanding of how ICTs can be used for social and economic development, and to equip policymakers and programme managers with a development-oriented framework for ICT-based and ICT-supported interventions in a range of social sectors. Provide a development-oriented framework for ICT-based and ICT-supported projects and interventions in a range of social sectors. Usha Rani Vyasulu Reddi is currently Advisory Faculty, International Institute of Information Technology and a Visiting Professor at the S.N. School of Communication, University of Hyderabad. Prior to this, she held several senior positions—as Director, Centre for Human Development, Administrative Staff College of India, Director, Commonwealth Educational Media Centre for Asia, and Director, Audio Visual Research Centre, Osmania University. She has more than forty years of teaching, research, and practice in the areas relating to ICTs for Development. Widely published, she is currently also engaged as a Master Trainer in ICTs for Sustainable Development throughout the Asia Pacific region. She lives in Hyderabad, India.